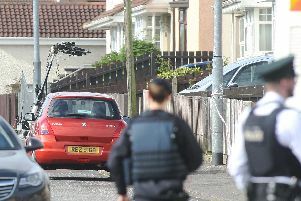 Residents of the unionist Fountain estate in Londonderry believe those responsible for a series of recent attacks have travelled into the area just to cause trouble. On Thursday and Friday, a series of projectiles were thrown over the dividing peace wall separating the unionist estate from the nationalist Bishop Street area – including petrol bombs, paint bombs and glass bottles. John Hetherington, who has been living in the Fountain for around 10 years, said his seven-year-old daughter “cried herself to sleep” following the attacks on Friday. Mr Hetherington also described how close the petrol bombs were landing to the house of his other daughter, who has two children of her own. “She is 24 and one of my grandchildren is five-months-old, and the other one is four,” he said. “We could have been getting a phone call in the early hours of the morning saying that they were burnt because it landed very close to the house. “And even where it did land, another half-a-foot and it would have been on top of an oil tank. “With the good weather and the bright evenings, we had been sitting out with the neighbours. “On the second night of it, the paint bombs came in during the afternoon and on the Friday night it was glass bottles they were throwing.